We all have things about our smiles that we don’t quite like – gaps, crookedness, or even some long, pointy canines (the teeth that can resemble vampire fangs). 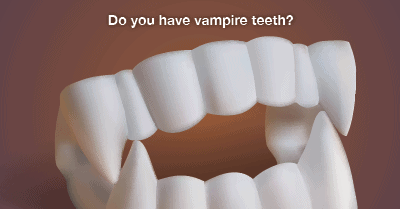 At my dental office in Mill Creek, we can advise you on the best ways to fix all of your dental problems, but in the spirit of the season, we’re going to dedicate this blog to educating you on how your pointy “vampire” teeth can be transformed. While there is nothing wrong with having a little extra pointiness in your teeth, patients often tell us that they’re self-conscious or get made fun of for their teeth’s fang-like appearance. There is actually a simple and inexpensive option your dentist in Mill Creek can offer to make your canines look more consistent with the rest of your smile and, yes, less pointy. If you think tooth reshaping or dental bonding is the right treatment for you, or if you have minor imperfections in your smile that you’d like to have fixed, give my Mill Creek dental office a call today. We’ll discuss your goals and the best treatment for you.